For those unfamiliar with Elliott Wave, please read The Big Picture: Long-term SPX Count and Projections. During the weekend, when I updated the short term charts, I must say it was slightly uncomfortable going out on a limb and calling for immediate upside on Monday. However, the market obliged my projections with fervor -- almost to the dollar on the NDX; and the SPX actually exceeded my projection by about 8 points. 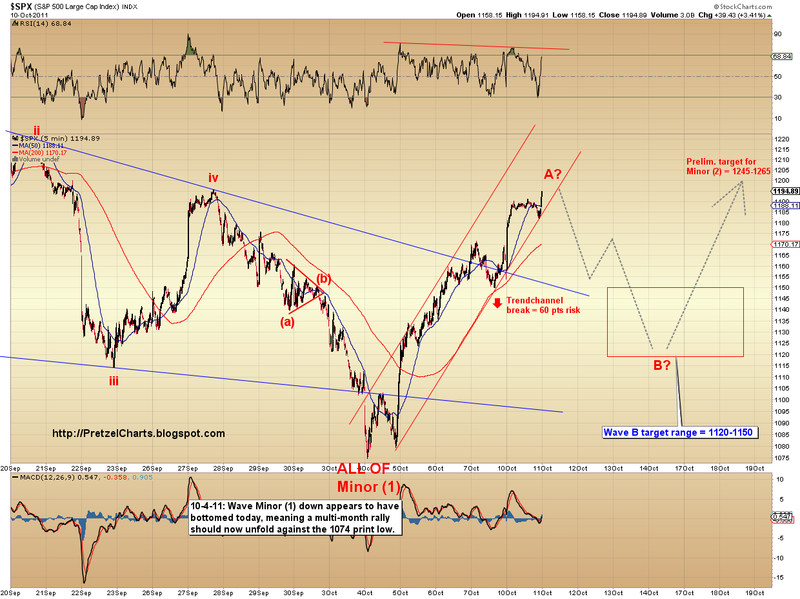 The market has now reached the point where the first leg of the rally could count as complete. The most likely scenario, based on the shortest time frames, would be a last gasp higher to cap this leg -- although higher prices are not required, and an immediate reversal can't be ruled out. Another, less likely scenario, is that we could see an extended fifth wave, which would cause the market to zig-zag its way higher more materially. However, unless the market begins to show some sign that this is happening, I am currently discounting the extended fifth wave as low probability, based on the fact that the move already had an extended third wave and two extensions in a wave is uncommon. A break of the lower trenchannel line (red) on the 5-minute chart (below) will be our first warning that the rally has most likely completed Wave A, and thus formed a short-term top. 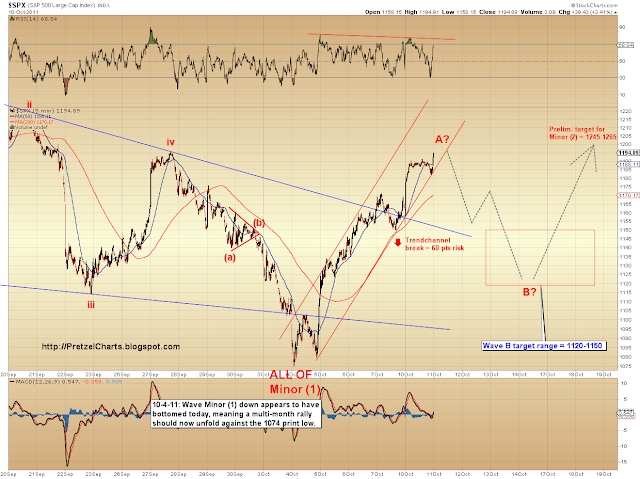 The chart also shows the most likely target range for Wave B: 1120-1150 SPX. The drawn-in gray lines on the chart below depict a simple "sharp" correction, however, B-waves are notoriously tricky and the wave could take many forms, potentially even forming a triangle or wedge. As the price action unfolds, I should be able to narrow down the form, and the price targets, with more accuracy. 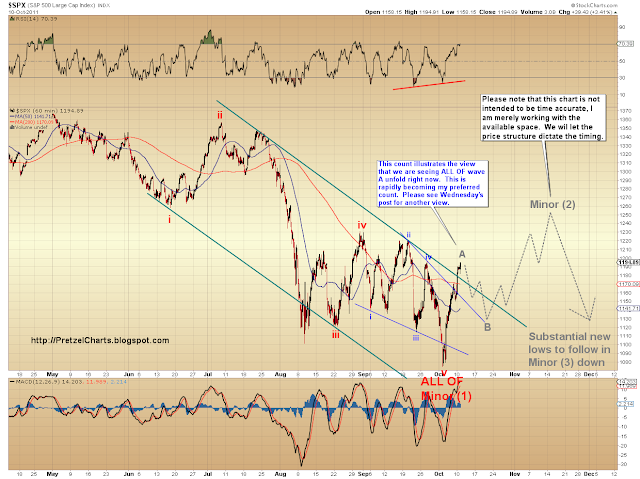 The NDX is in a similar position for the near-term. 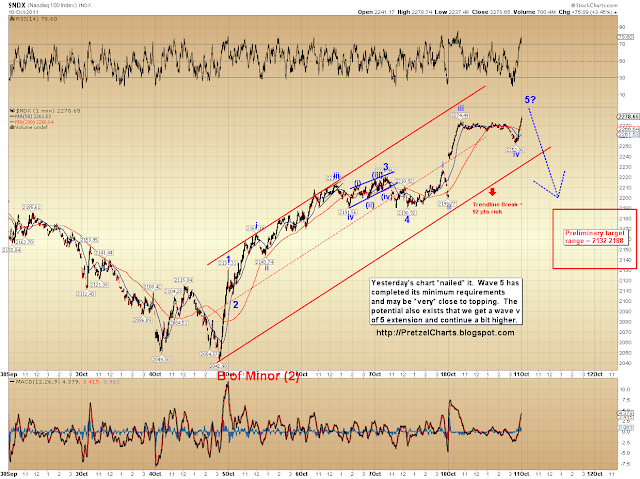 The preliminary target range for the assumed correction is 2132-2188, as shown in the chart below. 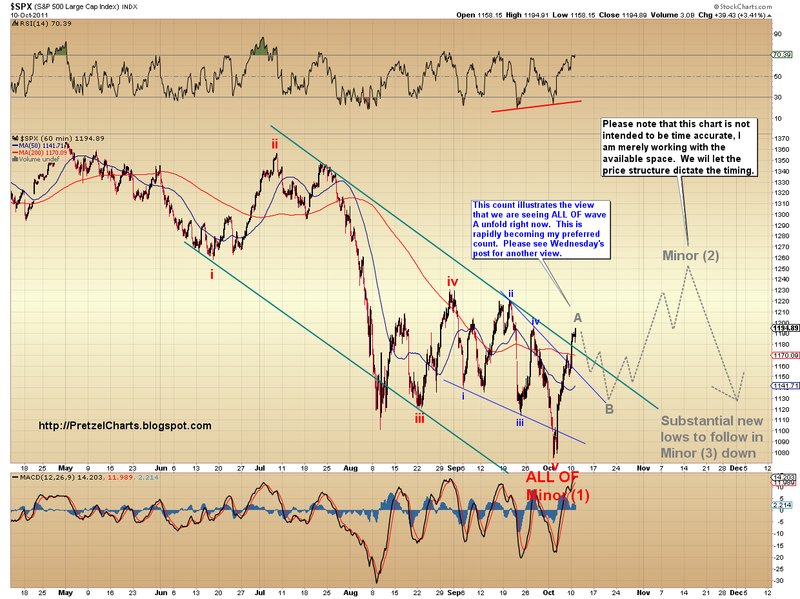 The current expectation is that the rally will continue thereafter. Please note that the target box isn't intended to be time-accurate; I'm just working within the available space. By the way, if you missed the weekend update, you might want to check out how close the NDX came to nailing the projection shown in this chart. Trade safe!